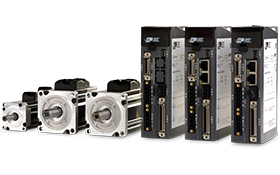 Full-featured servo drives in a variety of control options ranging from pulse & direction, analog torque/velocity and streaming serial commands, to the stand-alone execution of stored programs. An easy-to-use software interface makes setup and tuning the servo system a snap. SV200 Servo Drives are optimized for use with J Series Servo Motors. For drives operating on supply voltages from 24 to 60 volts DC click here. Which software goes with your servo drives? For our SV200 series servo drives, SVX Servo Suite software is used for configuration, auto tuning, fine tuning, and programming with its built-in Q Programmer interface. For our BLuDC4, BLuDC9, BLuAC5, SVAC3, and SV7 servo drives, Quick Tuner is used for tuning and configuration while Q Programmer is used for the programmable versions within this group of drives. All software from Applied Motion is free for download. Which control modes are available? Torque mode: analog or SCL commanded. Velocity mode: fixed velocity, analog velocity, or SCL commanded velocity with jogging commands. Position mode: Step pulse & direction input, CW/CCW pulse, A/B quadrature (encoder following), analog positioning, SCL commanded positioning, or Position Table mode (available on P models of SV200 series drives). SCL (Streaming Command Language) can be used for programming all Q models. It is also used for streaming commands from a host controller over a network connection, such as Ethernet, or over serial connections such as RS-232 or RS-485. Fieldbus protocols including EtherNet/IP, Modbus RTU and CANopen are also supported.